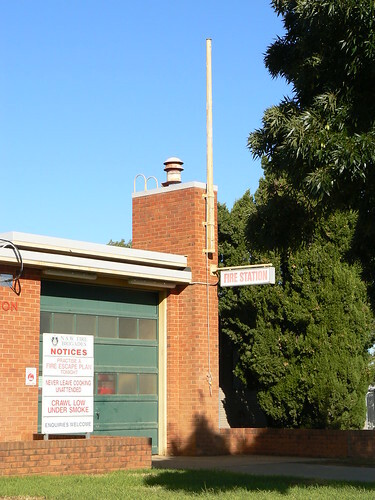 Yenda is a village near Griffith in the Murrumbidgee Irrigation Area (MIA) of New South Wales. When I first heard of it, it was described as a cluster of Art Deco buildings around a village green. While that is not exactly true, there is a village green in Yenda and there several Art Deco buildings facing the green and in the nearby streets and I think it is certainly worth a detour off Burley Griffin Way to have a look. 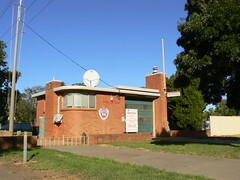 This is the Yenda Fire Station. It is interesting, I wouldn't have looked twice at this building, dismissing it as ugly and modern, but now that you point it out, I can see why it is Art Deco. The small things make all the difference. The curved corner at one end and the small tower and flagpole at the other. We had some not so great wine with dinner out last night. It was Yellowtail label and we wondered where it came from. Yes, Yenda. I knew Yenda was near Griffith and that it was a hot hot place. So there will more photos from Yenda? How funny Andrew. I think there are a few more photos to come. I presume you've seen my previous Yenda posts, especially the Yenda Cafe.